Do Catholics Worship Mary? Saints? No, But our statues do. The Catholics in attendance laughed at this common misconception; but the Protestants did not. Catholics worship God and God alone. But many Protestants really do think that we worship Mary and the Saints. Some understand that we don’t worship Mary and the saints but they don’t understand why we ask them to pray for us Many don’t understand the honor given to Mary as the Mother of God. Saints are people who lived lives of heroic virtue. They cultivated holiness while on earth. Now that they are in heaven, they are in perfect communion with God the Father, Son and Holy Spirit. They are more alive than we are! Mary, because she is the Mother of God is given the highest honor. Worship and adoration are only Given to God. Mary and the Saints are not gods or minor deities. They are part of God’s creation; they are creatures. We venerate Mary and the Saints. Worship. The Latin word for worship is latria which means service. In Christianity it means the worship and adoration that is reserved for God. Hyper Veneration. The Latin word is hyperdulia. This is the honor or reverence that is given to the Blessed Mother. She is given a higher degree of honor, as the Mother of Jesus, than the Saints. Veneration. The Latin term is Dulia. It is the honor or reverence that we give to the Angels and Saints. Veneration just means to regard with great respect. 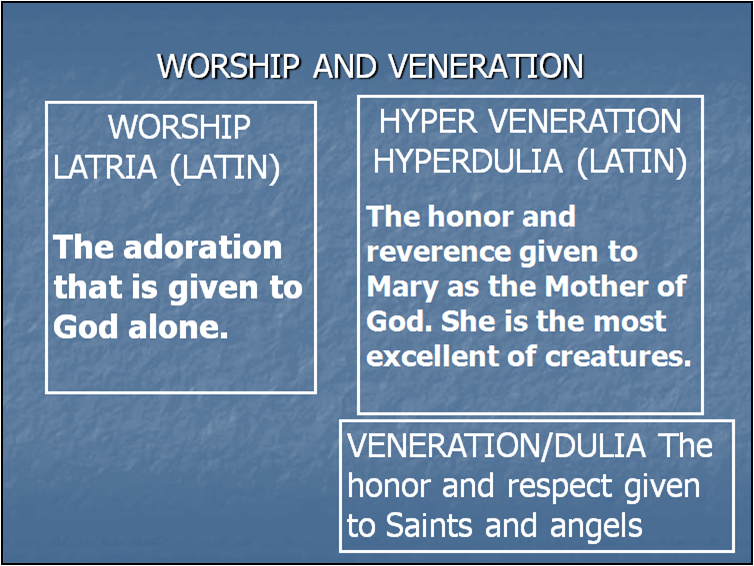 Worship is different in kind, and not just degree, from hyper veneration and veneration. We pray to them because they are friends of God. It is not an act of worship. We ask the Saints to pray that God will hear our prayers. Most Protestants do not have a problem asking their friends to pray for them. Asking Mary and the Saints to pray for us is the same concept. The Saints in heaven, the souls in purgatory, and those of us here on earth are all part of the communion of saints. The communion of saints is the Church. It is important to remember that all prayer is through Christ. Jesus Christ is the one mediator between God and man. This entry was posted in Apologetics, Saints and tagged Apologetics, Catholic, Saints, worship. Bookmark the permalink. 15 Responses to Do Catholics Worship Mary and the Saints? I’ve had this discussion with my husband’s brother. He contradicts himself being a bible only christian. When I tell him that we ask the Saints, Our Blessed Mother or those that we have lost in this life to pray for us, he says that we are praying to or conjuring up the dead. Go figure. I noticed on his Facebook wall that the notorious Dr. James White gave a seminar at their church, only to cause more hatred, confusion and untruths. Some people have a hard time realizing that the saints are far more alive than we are. They are sharing fully in the very life of God! But if your brother in law is listening to James White, he may be unable to really hear what you are saying. i am totally baffled, you say ” Why Do Catholics Pray To Mary And The Saints? We pray to them because they are friends of God. … We ask the saints to pray that God will hear our prayers. … Jesus Christ is the one mediator between God and man” if this last statement is true, that there is only one mediator, that being Jesus, why would you go through other supposed mediators Mary and the saints, for God to hear your prayers, or perhaps the statement about Jesus is false, and the true mediators are Mary and the saints, so don’t bother with Jesus at all, ? which is it, you cannot make two statements saying there both true and yet there opposites, it wouldn’t hold up in a court of law. Do you ask your friends and family to pray for you? I am guessing that you do. We approach the Saints, when we ask for their prayers, the same way you do when you ask people on earth to pray for you. Mary and the saints in heaven are more alive than those of us on earth. They are still part of the body of Christ. As friends of God in heaven, they are closer to the true mediator Jesus Christ. So we ask for their prayers. I am struggling with this question. I understand how Catholics are “asking” Mary and the saints to pray for them much the way that I may ask a fellow Christian (Briana) to pray for me. But the difference is that I do not constantly go to Briana every single time I need prayer nor do I build statues of her nor hold masses in her name. That is where I believe Catholics go wrong. Sorry Susan. One more question related to the topic…. I am debating becoming a deacon. However, I will never pray to Mary, say a rosary, or be devoted to her. What are your thoughts on this? Am I absolutely unable to pursue the role of deacon? The deaconate is a vocation–a call from God. It takes several years of discernment and education. As for your questions about Mary. We are not required to pray the rosary or ask Mary to pray for us. But all Catholics are required to believe in the Marian doctrines: Mary the Mother of God, the Immaculate Conception of Mary, The Assumption of Mary, the Perpetual Virginity of Mary. “With firm faith I believe as well everything contained in God’s word, written or handed down in tradition and proposed by the church–whether in solemn judgment or in the ordinary and universal Magisterium–as divinely revealed and called for faith. Frankly what is contained in the oath is something that all faithful Catholics should adhere to. Unfortunately, many dissent from the teaching of the Church. When members of the clergy dissent it causes a great deal of harm. So my question for you is why you will never as Mary for prayers? Can you be a faithful orthodox Catholic? I missed your first post. When I answered your question about becoming a deacon, I assumed that you are Catholic. Catholics do not go to Mary every time we pray. I, for example, pray to Jesus first. Then I ask Mary or another saint or several saints to pray for me. While I have statues of Mary and religious art in my house, not every Catholic does. I need to remember who I belong to–God–and the Saints remind me that it is possible to be holy. Each of us is called to be a Saint. While all Catholics are required to pray to God the Father, Son, and Holy Spirit there is not obligation to ask Mary and the Saints to pray. But I for one need all the prayers that I can get. So I go, often, to God’s good friends in heaven. Especially Mary the Mother of God. Thank you for replying. I have found your answers very helpful. A little bit of background on me. I was baptized a catholic as a baby and raised in catholic elementary and high schools. As a child I was extremely devoted to the faith. I can not explain it, but part of me thinks that you will already understand. In college and the early part of my career I backslid into the world and eventually atheism. I was an angry atheist and used to carry around a bible just to point out all of the alleged errors I thought that I had found. Through God’s grace I began a 3 year study into whether or not my atheism made sense and eventually was convinced that I was wrong and returned to the faith. However, I felt that part of my backsliding was due to alleged contradictions that I had found in the catholic church (I will admit that it may have been more of a misunderstanding of certain doctrines and practices although not entirely). I ultimately recorded several web based radio shows (The Pastor and the Skeptic) as well as developed a ministry that defended the faith apologetically. Upon my return to the faith I joined a fundamentalist baptist church (Protestant) and quickly swelled up the ranks to church leader (its youngest). I recently left the church for reasons that are best described as an aversion to fundamentalism that avoided any academic dialogue on the faith (that could be deemed secular reasoning…..after all, I am a former atheist) as well as the extremism that I experienced (I personally see no problem with dressing my daughter up as a princess during Halloween or dancing with my wife). I am now in flux. No church to legitimately call a home. I recently started attending catholic masses and have begun to feel (again) that same calling that I felt as a 12 year old who would run every morning to St. Rita’s before class in order to attend mass. Then I discovered the ministry of the deaconate (spelling?) and have for the last few weeks (due mostly to a desire to return to the catholic faith) have been studying the alleged errors in doctrine that I once held (very avidly) against the catholic church. I am starting to believe that the vast majority of the problems that exist doctrinally within the “church” (catholic) are mostly individual and community misunderstandings of the theology. 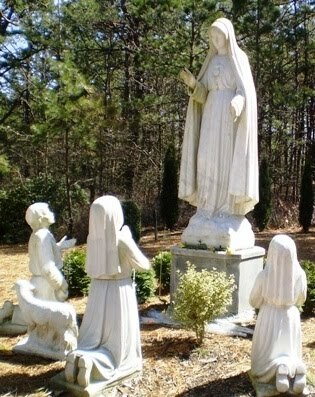 You see, my family comes from South America where people virtually worship Mary and exclusively go to her for prayer. We have “el señor del arbor” (the man of the tree – aka Christ crucified) and a whole bunch of practices that take the believer away from the true center of the word……Jesus Christ. I believe most Catholics can not state with certainty whether or not they will go to heaven or hell (another problem I have with the church). Christ died for our sins. Faith is all that saves us. Faith without works is dead, but it is not the works that saves us, it is the faith (evidenced by works) which saves us. The sacraments (in my personal opinion) are intended to guide believers toward growth in faith as well as works that both evidence our faith and glorify the Lord. However, I believe that most (not all) Catholics have confused this with the belief that it is only the sacraments (“I am going to heaven because I was baptized as a child”) or their attempts to be “good people” that will give them a chance at salvation………when this could not be any farther from the truth. In conclusion (sorry for ranting), I have felt a calling. I am being patient with it because I want to make sure it is God sent and not Mike-sent. But I feel an affinity towards the role of being a deacon. Perhaps……this is where God is leading me. You are quite right. I do understand your journey. Like you I had a strong faith when I was a child. When I was in my twenties, however, I became a just in case Catholic–I went to Mass just in case it was true. Michael, from what you have written, I believe that God is inviting you home to His Church. In the Mass we pray what we believe. That is why you feel what you felt as a young boy. You are right to say that many of the doctrinal problems are not problems with the doctrines themselves. They come from Christ. The people in the pews, and fallen away Catholics have been poorly taught for 40 years since Vatican II. That is beginning to change, but we have a long way to go. A lot of damage has been done. You are quite right to say that we are saved only by grace. In the Sacraments , God becomes touchable, knowable, and receivable. God offers his grace in abundance to us. He invites us to participate in the very life of God the Father, God the Son, and God the Holy Spirit. But we have to cooperate with that grace. God loves us and he wants us to be saved through the cross of Christ. But God has given us free will; He does not force us to be saved. It is our choice. Accepting God’s grace means that we are called to “pick up our cross” and follow Jesus. Jesus said that “we are to be perfect as your heavenly Father is perfect” (Mt: 5:48). This means that we are called to be saints–called to be holy. This is much more than being nice. It is a call to Agape. That is a call to love God and neighbor in a self sacrificing and self giving way. It means to put others before myself. We must always be converting–turning away from sin and turning back to God. That is how are hearts are transformed. Hell exists. But since I can’t possibly understand God’s great mercy, I don’t know if it is populated by humans. But seeing the evil that some people commit, it is conceivable that there are people who flat out reject God’s love. There may be people who choose hell which is the total absence of God. All who strive to follow Jesus and him crucified and who keep his commandments will enter into the kingdom sometimes after a period of purgation. Michael, I urge you to read the Catechism of the Catholic Church. That is what, after much nudging from God, led me back home to fully embrace the Church and her teachings. Here is a link to Amazon (there is a much cheaper compact edition but it is hard to read) http://www.amazon.com/gp/product/0879739762/ref=pd_lpo_k2_dp_sr_2?pf_rd_p=486539851&pf_rd_s=lpo-top-stripe-1&pf_rd_t=201&pf_rd_i=0385479670&pf_rd_m=ATVPDKIKX0DER&pf_rd_r=1YZ65G3Q7XZBQ5AEAK93. The Catechism is also on line: http://www.usccb.org/catechism/text/. Michael, please feel free to email me, as often as you would like, when you have questions or concerns. My email is lpksmk@msn.com. You are in my prayers. Thank you for your answer (again). It was very comforting. A couple more questions rose. I will post them here. Should I email you privately instead, or do you feel that my questions on this blog might serve as an opportunity to edify other readers? This was very critical for me. I did not think that this challenge was recognized by the church nor did I think that the church was doing anything about it. Can I ask you….what specifically are the “poor teachings” and, more importantly, how is the church addressing it? 2. Can you please “back up” your belief in purgatory with the bible? This is another “question” that I wonder about. I believe that Christ died for our sins. We are saved by faith. Works most be evidenced if our faith is legitimate. The sacraments help guide us in our faith. But if we remain “believers” (i.e., trusting in the work of Christ on the cross) and if our faith is legitimate…..we shall be saved. If Christ did the works for us……where is the need for a purgatory? Did Christ die in vain? Or was his death not enough for the forgiveness of our sins? Purgatory does not seem biblical to me. 1. You ask what are the poor teachings of the Church. Well it is more like there has been a watering down of the teachings. Everything was reduced to Jesus loves you. It was Jesus without the cross. Salvation without the need for continual conversion and repentance. It was a time in the desert which caused people to forget that we Catholics are a sacramental people. The Catechism of the Catholic Church was written to address this catechetical crisis. 2. st. Augustine pointed out that even the bad angels believed in God–they knew for a fact that he existed–and yet they rebelled. They rejected God’s love. Jesus tells us, continually in the Gospels, that we have to turn from sin. In Matthew 7:21 he tells us the not everyone who cries Lord, Lord will enter the Kingdom. Only those who do God’s will enter haven. Matthew 25 Jesus warns us that at death we will be judged according to our acts. We will be judged as either sheep or goats. Purgatory is a great mercy. Many of us who fight the good fight and have one the earthly battle, will not be ready to enter the bright light of heaven. Purgatory is the hospital of heaven where those who are wounded by sin. I have written on Purgatory https://adeaconswife.wordpress.com/2010/07/07/purgatory-part-i/ . There is a link to part one, but I suggest that you start with part II. The reason large groups of Protestants will never be able to become Catholic or vice-versa comes from a belief in what is authoritative. Most Protestants would say they believe only in what they find in the Bible. Catholic authority comes from the Pope, tradition and the Bible, including the non-canonical apocrypha that Protestants reject. Throughout these posts I find comments that fall into the non-Biblical lines of authority – (i.e. Mary ascended and was a “virgin” forever despite documentation of Jesus’ brothers). Just because it’s not in the Bible doesn’t mean it can’t be true. But because these things are not in the canonical books, Catholicism and Protestantism will continue to split the body of Christ and not be as it was intended, with one or the other feeling they have the extra special secret hotline to God. Both can’t be totally right. And the odds are, neither is totally right. I wonder what Jesus would say about all of the money and pageantry that seems to dominate churches on both sides of the table? When people ask me, I say I’m “Just a Christian.” Or sometimes I’ll say I’m a “Christ follower.” No one has authority over me except God. Almost everything else involved in the bloated “religions” of today just gets in the way of that. Welcome. I am going to answer your objections in a blog post. It may take awhile. Thank you for your comment.